"This is an authentic Indian Naan recipe. I have made this many times. It goes well with Indian curry which has a lot of gravy, such as the Butter Chicken." Whisk the warm water with the yeast and sugar until the yeast is dissolved. Cover and let stand in a warm place for 10 minutes. Sift flour and salt three times into a large bowl add the yeast mixture, half of the ghee and all the yogurt. Mix into a soft dough then knead on a floured surface for about 5 minutes or until dough is smooth and elastic. Place the dough in a large greased bowl, cover and let stand in a warm place for 1 1/2 hours or until the dough is doubled in size . Punch down dough then knead for 5 minutes. Divide dough into 6 pieces. Roll each piece out into 8 inch round naans. Cover an oven tray with foil and grease the foil. Brush the naan with a little of the remaining ghee and sprinkle with some of the kalonji. 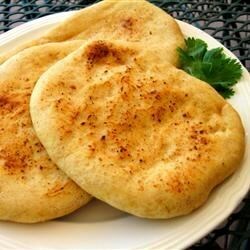 Cook naan one at a time under the broiler for about 2 minutes on each side or until puffed and just browned. See how to make authentic Indian flatbread. I am from the Netherlands and a friend from the USA showed me this site. I was looking for a recipe of Naan for a long long time. This 1 is great!! Very tastfull and soft and easy to make! I've never made Naan before and this was amazing. The texture was perfect. I used butter in place of the ghee and fried on the stove top.